When first hearing about the new e-book, ‘Photograph‘, by Ringo Starr, I expected the traditional flip-through type of photography book in electronic format similar to the recent release of ‘Linda McCartney: Life in Photographs‘ from Taschen. But this new e-book from the ex-Beatle offers so much more. ‘Photograph’ seems more like an app than just an e-book. Most e-books are adapted from their original hard copy versions resulting in a straightforward recreation in digital form, with static text or photos on each page. But since ‘Photograph’ was first developed as an e-book with no hard copy to work off of, Ringo along with Genesis Publications has put together something more interactive. While ‘Photograph’ does have the traditional elements of an e-book with photos and text on each page, the reader is invited to search further for more information. Hit the “drum” icon to hear Ringo give more details about a specific photo and the e-book begins to feel more like a documentary about Ringo’s life (i.e. “This is me as a baby”). Some pages offer small images of memorabilia, and when clicked on, they expand on the screen, for example, to show the front and back of an item or all pages in a historical document. In addition to audio clips, the 149-page electronic book also offers current video of Ringo talking about the book and his personal recollections. Each chapter has a summary page where a collage of all the photos included in that chapter appear. This behind-the-scenes look at the life of a Beatle offers interesting and fun photos like Ringo in an old car in Liverpool (page 40), Paul looking very French (page 54) and a cute photo of future musicians Julian Lennon and Zak Starkey together as kids (page 129). Ringo’s eye for photography comes through in shots like the snow-covered train tracks in Washington DC (page 82), Ringo’s use of a fisheye lens showing The Beatles as tourists during their concert tour (page 104) and a unique angle during the filming of ‘A Hard Day’s Night’ (page 86). Ringo Starr’s e-book, ‘Photograph‘, published by Genesis Publications is one part of a three-part project exploring the archives of the ex-Beatles’ drummer. Part two is the exhibit, Ringo: Peace & Love, currently on display at the GRAMMY Museum and part three is an expanded hardcover version of ‘Photograph’ coming out in December 2013. Starr has repeatedly said that he will never write his autobiography, so ‘Photograph’ is probably the closest fans will get to a first-person account hearing Ringo share recollections of his life before, during and after The Beatles. Knowing that this is just a smaller version of the hardcover book coming out in December just whets the Beatles fan’s appetite for more of Ringo! ‘Photograph’ is available on iTunes from the iBookstore. Categories: New Beatles merchandise, Reviews | Tags: ebook, genesis, photograph, review, ringo starr | Permalink. “A zany representation of vivid minds at the time” — that’s how Paul McCartney summarizes The Beatles film, Magical Mystery Tour, or rather justifies it in the new DVD release out this month. Regarded as a disappointment after the success of A Hard Day’s Night in 1964 and Help! in 1965, the Magical Mystery Tour film represented the first time The Beatles took control of their own movie, serving as directors and producers of the 1967 film. However, it is inevitable that a film with no script, contributing to a “more dreamlike” ambiance, would likely have challenges. Ringo Starr explains that as the designated “acting Beatle”, he was told to ad lib with British actress Jessie Robins, who played Aunt Jessie, and make up dialogue between the two. Two Beatles Fan Club secretaries who were asked to be extras in the film described the filmmaking process as slightly chaotic citing the example that they had to wear the same clothes for several days and had last-minute sleeping arrangements. The Beatles also had challenges in the editing room. Rare footage of John, Paul, George and Ringo is included on the DVD showing them in the editing suite with Editor Roy Benson. The Beatles thought the film could be edited in a week, but the reality was that it would take up to three months to complete. The “Meet The Supporting Cast” segment in the Special Features section offers interesting background information on the lead actors that the Beatles hired for the film including Victor Spinetti, Ivor Cutler, Jessie Robins and Nat Jackley. However, the re-edits of “Your Mother Should Know”, “Blue Jay Way” and “The Fool on the Hill” seemed more like blooper reels. The previously unseen footage doesn’t really add much to the music videos, leaving the original footage much more desirable to watch. 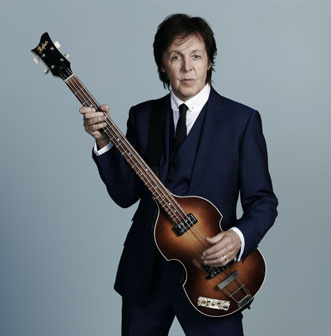 In the end, McCartney stands by the significance of the film claiming that Steven Spielberg recalled being shown Magical Mystery Tour in film school as an example of a “different approach to filmmaking.” Fans can agree that the highlights of the film are the musical performances of “The Fool on The Hill”, “Blue Jay Way”, “Your Mother Should Know” and “I Am The Walrus.” Regardless of your opinion of the film, the new DVD release provides behind the scenes stories that provide insight into The Beatles’ creative process. Note: A Magical Mystery Tour Deluxe Box Set is also available which comes with the DVD, Blu-Ray, Double-Vinyl EP and a 60-page booklet in a 10″ square collector’s box. Win a copy of the new DVD in our Fall 2012 contest! Categories: New Beatles merchandise, Reviews | Tags: beatles, blu-ray, director's commentary, dvd release, magical mystery tour, Paul McCartney, review | Permalink. Thirteen years after its first DVD release, The Beatles’ animated film, Yellow Submarine, was re-released on DVD and Blu-ray on June 5. Yellow Submarine captures the heart and spirit of The Beatles and has become a classic animation film. The current restoration of the film allows viewers to see the most vibrant colors intended to evoke the mood of the psychedelic 60s. The film was restored by hand, frame by frame, because of the delicate nature of the hand-drawn original artwork. Hard to believe that a film which is so beloved by so many had such a rocky road to completion. Back in 1967 before his death, The Beatles’ manager, Brian Epstein, convinced The Beatles to go along with the project to fulfill their film contract with United Artists. The Beatles hesitantly agreed even though they were fearful that the film may turn out like The Beatles ABC-TV cartoon series which they were not a fan of. But as Production Executive John Coates describes in the bonus audio commentary, as the film began to take shape, The Beatles became more and more interested in the project. The Beatles’ suspicions that the filmmakers would “Disney-fy” them were put to rest when they attended advance screenings throughout the production process. The film was completed under an ultra-tight schedule of 11 months. Designers and animators had to constantly work around the clock to complete the film in time for the July 1968 premiere date in London. Time was so precious that students from London art schools had to be brought in night after night to help with the coloring of the hand-drawn cells. Coates estimates that there were anywhere between 100,000 to 200,000 animation cells that were used to create the film. The film became an instant classic upon its release receiving rave reviews like this one from the Daily News: “Thunderous applause! I doubt that the Beatles themselves can top their ‘Yellow Submarine’!” The film even received a special honor in 1968 from The NY Film Critics Circle Awards. The new DVD/Blu-ray release includes a 7-minute bonus behind-the-scenes documentary called the “Mod Odyssey” from 1968. Additional bonus features include the film’s original theatrical trailer, audio commentary by producer John Coates and art director Heinz Edelmann, several brief interview clips with others involved with the film, storyboard sequences, 29 original pencil drawings and 30 behind-the-scenes photos. Both Digipak packages include reproductions of animation cels from the film, collectible stickers, and a 16-page booklet. Along with the DVD releases, the Yellow Submarine songtrack has also been re-issued, as well as the Yellow Submarine children’s book. 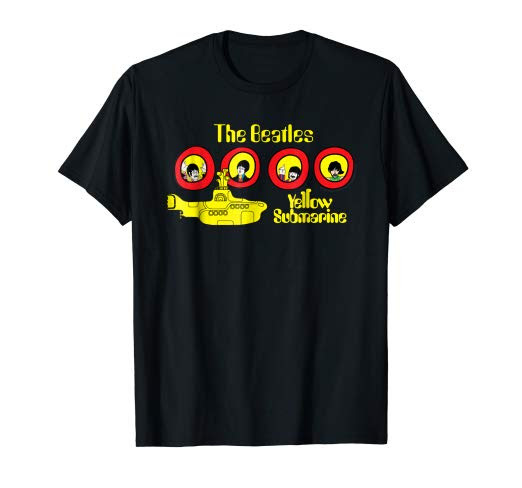 Categories: New Beatles merchandise, Reviews | Tags: 2012, beatles, blu-ray release, cd release, dvd release, restoration, review, yellow submarine | Permalink. Don’t get me wrong, it’s a good thing — but we Beatles fans are up to our ears in the recent releases of remastered CDs — John Lennon’s entire solo catalog, the Beatles Red and Blue albums, the Apple Records Box Set, not to mention last year’s Beatles remasters in stereo and mono. And today, November 2, marks the release of Paul McCartney’s Band on the Run remastered CD coming in three different packages. It seems like just yesterday when the 25th Anniversary Edition of Paul McCartney and Wings’ Band on the Run was released. In actuality, that version came out 11 years ago in 1999. While it may not seem like enough time has passed to warrant another Band on the Run release, the first release from the ‘Paul McCartney Archive Collection’ knows how to lure in its fan base — great bonus material, of course! If you don’t have a CD copy of Band on the Run, getting this remastered version is a no-brainer. But for those of us who may already have previous versions of the album and/or the CD, it always helps when the powers that be add a few extras that most loyal Beatles/McCartney fans won’t be able to pass up. Case in point – the previously unreleased documentary, One Hand Clapping, filmed in Autumn 1974 at Abbey Road Studios in London. This (approx.) 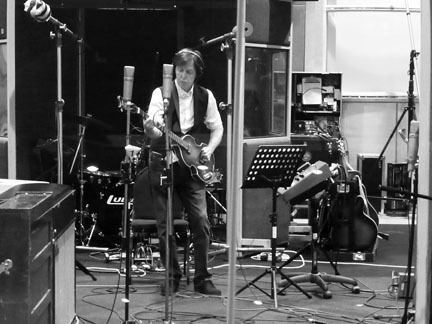 45-minute film is a gem because it shows a rarely seen side of Paul McCartney behind-the-scenes and relaxed in a studio environment surrounded by his Wings’ bandmates including his late wife, Linda McCartney. The best moment in the film is during the performance of “Nineteen Hundred and Eighty-Five” when Paul sings while holding a microphone and stands in front of the camera without an instrument — a rarity indeed. We even see Paul dancing and bopping along to the song! Gambaccini reveals some interesting trivia like the fact that at the time Paul and Linda had a black labrador puppy named “Jet,” and the song “Helen Wheels” is only on the bonus audio CD because it was originally released as a single and not included on the original Band on the Run album in the UK. Another fascinating piece of Band on the Run history can be seen in the short bonus video footage documenting the Band on the Run album cover photo shoot at Osterley Park. Paul recruited six celebrities to appear with Linda, Denny Laine and himself in the classic renegade/prison break shot. In this bonus footage you see Paul interacting with actor James Coburn, boxing champion John Conteh, Clement Freud (grandson of Sigmund), actor Christopher Lee, singer Kenny Lynch and popular British TV host, Michael Parkinson. The Band on the Run ‘Special Edition’ includes the remastered album, the bonus DVD described above and a bonus audio CD featuring several live performances from One Hand Clapping. While most of the tracks are live versions of the original Band on the Run songs, it would have been nice if a few of the songs on the bonus CD were the lesser known songs featured in One Hand Clapping like ‘Soily’ and ‘All of You’. 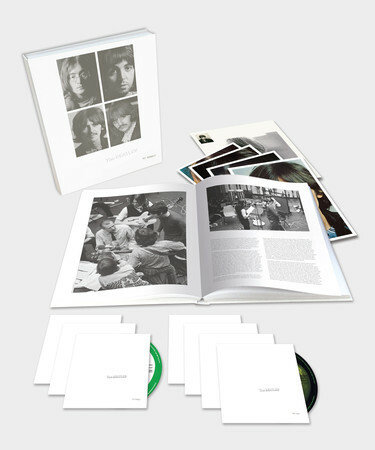 For the true collector, the 4-disc deluxe edition offers even more bonus material including an extra CD featuring an audio documentary (originally included in the 25th Anniversary edition) and a 120-page book “containing many previously unpublished images by Linda McCartney and Clive Arrowsmith, album and single artwork, and a full history of the album, complete with a new interview with Paul” as stated on McCartney’s official website. Categories: New Beatles merchandise, Reviews | Tags: band on the run, Linda McCartney, one hand clapping, Paul McCartney, remastered, review, wings | Permalink. In 1963 Judy was 15 years old. She’d had a rough year. But in late 1963 she caught a glimpse of four lads from across the pond that would change her life forever. There was one lad in particular that really caught her eye. In A Date With A Beatle, Judith Kristen tells the true story of how, with grit and determination, she made the dream of meeting George Harrison a reality. A Date With A Beatle follows the adventures of Judy and her reluctant (at times) friend Shelly who do all in their power to meet their idols, the Beatles. Judy was a George fan. Shelly, a Ringo fan. They would be ‘Judy Harrison’ and ‘Shelly Starr’, respectively. The only things in their way were the police and the thousands of other screaming girls who dreamed the same dream. But, those other girls didn’t have Judy’s tenacity! The story takes place in the Philadelphia area and chronicles how these two young women go from location to location to see the Beatles in concert and then find out where the group was staying, make reservations at the same hotel, and try to fulfill their goal. There are obstacles along the way — the police being the main one. But with Judy’s charming irreverent wit, she was able to get pretty close to her George a few times, all things considered. Judy was a very determined girl! A Date With A Beatle is a really great read. You’ll be able to read it in one easy sitting. Judith tells her story with such great humor that really illustrates this young woman’s tenacity and boldness to achieve her goals. It is a very entertaining tale that allows first generation fans to relive that excitement again and for the second and third generation fans to see what it was like in the height of Beatlemania and to be green with envy. Categories: Reviews | Tags: beatles, book review, george harrison, review | Permalink.